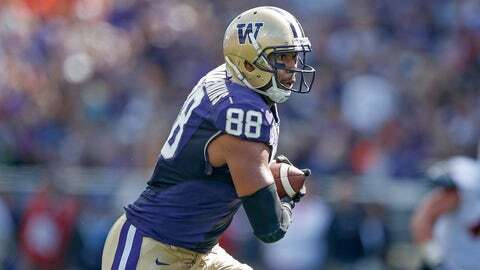 Austin Seferian-Jenkins caught 33 passes for 413 yards and 7 touchdowns in 2013. Washington tight end Austin Seferian-Jenkins has a tough decision to make after his team plays BYU in the Fight Hunger Bowl Dec. 27: Stay in school for another season or make the leap to the NFL. Seferian-Jenkins, a junior who won the 2013 John Mackey Award given to the nation’s most impressive tight end, received a second-round grade from the NFL Advisory Committee, a source informed on the situation told FOXSports.com. The committee, which is made up of pro scouts, typically reviews the player’s tape and tabulates a grade for each player that applies. The player will fall into five categories: first, second, third, fourth-seventh or unlikely to be drafted. While the grade isn’t foolproof, it gives the player and his family an idea of where he’s pegged to go in the draft. The 6-foot-6, 276-pound tight end posted career lows in receptions (33) and yards (413), but proved to be a consistent threat in the red zone hauling in 7 touchdowns. Seferian-Jenkins was named a third team/honorable mention All-American by The Associated Press earlier this week. While he has dazzled on the field during his three years in Seattle, NFL teams will question his judgment after a July DUI arrest, which made national headlines. If Seferian-Jenkins can prove he was humbled by his mistake, he’ll likely be one of the first players selected from his position. North Carolina’s Eric Ebron and Texas Tech’s Jace Amaro, who still has to make a decision, will also be highly regarded tight ends.